How to attract prospects in your shop and awareness? How to attract prospects into your shop and increase awareness? Home/marketing/How to attract prospects into your shop and increase awareness? The festive season is around the corner. It’s the perfect occasion to drive that new product launch or revamp your marketing campaign. Thankfully, we have just the right idea you were looking for. Our unique Gift Box is certainly one way of bringing more joy to your budget this season or any time around the year. Moreover, it packs a delightful surprise for your audience too. Plus, it overcomes the traditional challenges of engagement most digital activations face. What’s not to love? CREATE A BUZZ WITH THE GIFT BOX. Want to really showcase the exclusivity of your new product? Trying to generate more footfalls to your store or event stand? We all want our audience to engage with our digital activation. But the truth is, that’s easier said than done. Thankfully, here’s one way of guaranteeing excitement and engagement: iboothme’s amazing Gift Box. A unique way of showcasing your product in a transparent case and generating excitement around it. UNWRAP THE EXCITEMENT ANYWHERE AND EVERYWHERE. So here’s the fun part of how it works. 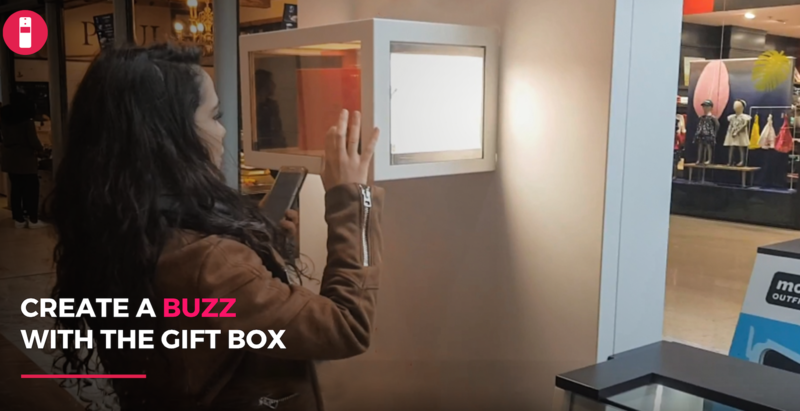 The Gift Box works with any of our exciting photo booth solutions. Whether it is the selfie ball, the roaming photo booth, the mirror photo booth, including even our 360 photo booths, and others. All your audience needs to do is enter the secret code received through the photo booth or your activation to open the Gift Box. Imagine the intrigue and the buzz you can create. It not only takes the engagement to a whole new level. It also makes your activation and product more exclusive. After all, we all love a bit of exclusivity, don’t we? And this new innovation packs plenty of it. The Gift Box is a unique, clever and effective idea that can be tailor-made to suit your requirements in terms of budget, size, time and message. What’s more, our data collection systems means you can retarget your audience with messages at any stage in the future. The best part is that it’s simple to implement and can be automated to deliver your message. Run a raffle draw, a game, a treasure hunt or a free promotion of a product. The possibilities are really endless. Here’s a quick demo to show you how the Gift Box works. View the video here. Our Gift Box is just one of our many ideas. Get in touch with iboothme now to know more. You can rent out our Gift Box or any of iboothme’scustomizable roaming photo booths or video booths anytime and anywhere you want. Or just talk to us and we’ll be happy to brainstorm on your next big idea. Why wait. Unlock the potential of your next digital activation now. Why our new Boomerang Ball roaming photo booth is grabbing eyeballs everywhere. How to drive Instagram followers to your shop: Our little app unlocks the big secret.